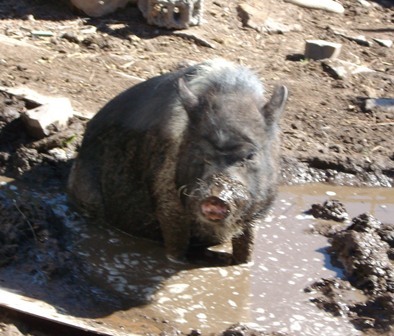 Mini pigs are smart. Everyone has heard that. About a year ago, they figurecd out how to open the refrigerator. What a day!! They took everything out and spread it around the kitchen floor, so the dogs joined in. Disaster! 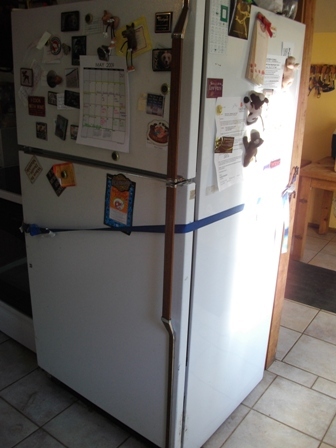 So , for a quick fix, we took a moving strap and put it around the fridge-look out Clampets, you have competition for style! This did work, and it helped with the diets, but every time we forgot to close the strap, of course, the pigs would get in the fridge. Finally, one day I opened the door (of course, we had company at the time) and it fell off. Lovely. Time for a new fridge. So, humans are smarter than pigs,right??? Instead of getting a fridge with a lock on it (I did think about that). I decided to get the door opening next to the stove-clever eh? IT WORKED! ————–for about a year. A month ago, this is what they did. They took the drawer out under the stove, moved it to the middle of the floor, then they could move the whole stove out of the way so they could get to the refrigerator door- FOOD ON THE FLOOR AGAIN!! I think we have the pl ace pigproofed finally- not only do we have a hasp on the door of the fridge, we have it BOLTED to the wall. I’ll keep you posted. ROFLMAO!!!! 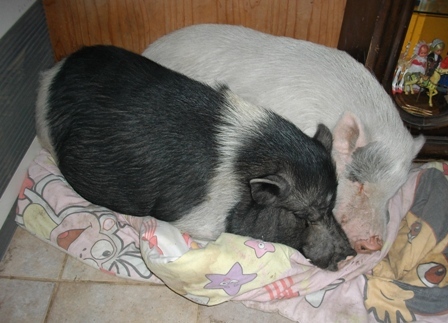 Welcome to the wonderful world of house pigs! !